Squashes and pumpkins are easily associated with autumn, but they shouldn’t be the sole reserve of savoury dishes. Pumpkin pie is much loved in America –always reminds me of growing up in New England and I urge you to try it – you won’t be disappointed. You need cold hands, a cool area and a patient temperament to make pastry from scratch. Without them it’s a struggle. This recipe makes more than you need for the one tart – it’s very hard to make a small amount of pastry – but any you have left will keep, tightly wrapped, in the fridge for up to four days. 2. With the mixer paddle still moving slowly add the egg yolks one by one to the mix. 3. Once incorporated add the flour to the bowl. Mix gently until the paste starts to come together. 4. Drizzle in some of the water. You may not need all of the water. As soon as you’ve added enough for the paste to form a ball and come away from the sides of the bowl stop mixing. 5. Separate the dough into 4 balls and slightly flatten them. Wrap them in cling-film and refrigerate for at least 30mins. 6. On a cool surface, lightly dusted with flour, roll out one of your balls slightly wider than your tart tin and no thicker than 2 mms. Lightly dust your rolled pastry with flour and place rolling pin on top of the pastry. Roll the pastry over and around the rolling pin then lift it up and gently unroll it into your tart mould. Make a little marble of excess dough and use it to gently push the pastry into the corners of the tin. Leave the excess pastry hanging over the edges of the mould – we’ll trim them later. With a fork prick the pastry base all over and leave to rest in the fridge another thirty mins. 7. Line the base with greaseproof paper and pour baking beans up to the top (fancy ceramic or dried chickpeas will do). Bake at 165c for about 20 minutes. Remove the baking beans and paper and brush the tart with the egg yolk and milk – this will patch up any cracks and waterproof your tart shell from the filling keeping it crisp and short. 8. Return the tart shell to the oven for five minutes, or until golden brown. 1. In a stand mixer whisk together the eggs and the two sugars until they fluff up and turn a pale colour, doubling in size. 2. Gently fold in the flour and spices. 3. Split the vanilla pod, scrape out the seeds and add to the mix. 4. Fold in the pumpkin pureé followed by the melted butter, double cream and a generous slug of rum. 5. 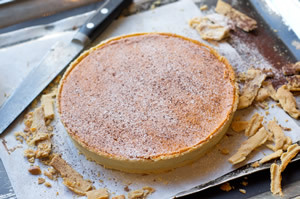 Pour the mix into the tart shell and bake at 160c until it’s just set like a custard tart – about 20mins. The top will go slightly golden brown and it should still have a slight wobble in the very middle like a custard tart. 7. Sprinkle with icing sugar to serve, warm.